How to View Shortcuts Properties? All invalid shortcuts will be displayed in a list under four columns in the main window. Thus you can clearly view the info of each shortcut. The properties of the selected shortcut are accessible. 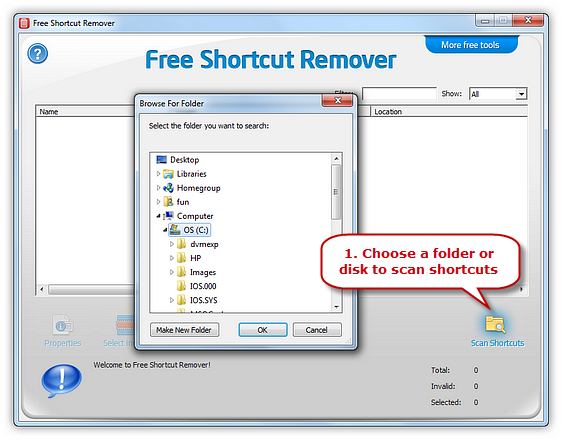 Launch Free Shortcut Remover and click “Scan Shortcuts” to choose the drive you want to scan. Click “OK” and the scan will start immediately. The shortcut files found will be listed with info like name, target, location and other details. The program marks the broken shortcut (when the file it is linking to is missing) with a red cross so you can spot it easily and solve the problem. 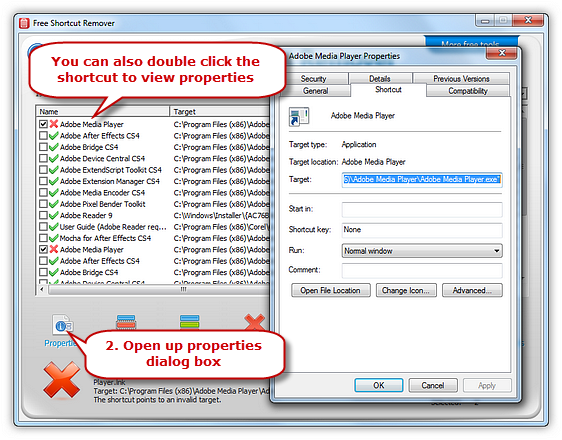 Click “Properties” or double click the shortcut to open up the properties dialog box for the item.